Mark Jones of Peterborough Sports appeals in vain during the Northants Cup semi-final against Brackley. Photo: James Richardson. 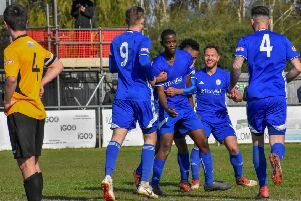 Peterborough Sports will go into tomorrow’s (February 10, 3pm) tough-looking Evo Stik League clash with high-flying Frickley Athletic at PSL full of confidence. The city side are threatened by relegation from Division One South, while in-form Frickley are second. Dan Cotton (right) has reached 150 goals for Yaxley. Sports lost out in a nine-goal thriller at Chasetown last Saturday before holding higher-level Brackley Town to a 0-0 draw in the semi-final of the Northants Senior Cup on Tuesday. Sports lost the penalty shootout 10-9, but manager Jimmy Dean is convinced his side have turned a corner. “I sense the lads are starting to believe they can climb the table,” Dean said. “They have been spot on in the last few matches and when they are like that we can beat any side in this division. “That includes Frickley who are very strong, on a great run and apparently have an outstanding front four. “But we will go into the game with a lot of confidence after the Brackley match. They are an outstanding team who beat a top National League side in the FA Trophy last weekend and who could be playing at that level themselves next season so to match them for 90 minutes reflects well on us. Sports have a key game at fellow strugglers Kidsgrove Athletic next Wednesday (February 14). Jockeying for top spot in the ultra-competitive United Counties Premier Division continues tomorrow. Leaders Yaxley should stay out in front as they host bottom club Oadby (3pm), while second-placed Holbeach United entertain mid-table Wellingborough Town. Fourth-placed Deeping Rangers have a tricky game at home to sixth-placed Eynesbury Rovers and fifth-placed Wisbech are at home to Rothwell Corinthians. There’s a big game next Tuesday (February 13) when Wisbech host Yaxley. Key man for Yaxley could well be Dan Cotton whose two goals in midweek made it 150 in 189 appearances in four years at the club. Division One leaders Pinchbeck United are at bottom club Stewart & Lloyds tomorrow. The home side have won one and lost 25 of their league games this season. It’s derby day in the Eastern Counties League as Wisbech St Mary entertain March Town United. Division One South: Bedworth United v Stamford AFC, Peterborough Sports v Frickley Athletic, Spalding United v Stocksbridge Park Steels. Premier Division: Deeping Rangers v Eynesbury Rovers, Holbeach United v Wellingborough Town, Peterborough Northern Star v Northampton ON Chenecks, Wisbech Town v Rothwell Corinthians, Yaxley v Oadby Town. Division One: Huntingdon Town v Blackstones, Raunds Town v Bourne Town, Stewart & Lloyds v Pinchbeck United. Division One: Wisbech St Mary v March Town United.